English is seen as being complex, full of exceptions, and without consistent rules. But what if there were strategies we could teach that reveal consistent patterns to help "make sense" of the English language for our ESL students/English Language Learners? Teachers may not teach some of the consistent patterns that do exist in English because they simply don't know what those strategies are themselves. I thought it would be helpful to repost my ESL teaching tips blog post to reinforce some consistent, systematic strategies I've learned that teach basic pronunciation, spelling, decoding, and grammar. I've been fortunate to work with these (and other) strategies over the last several years in the form of classroom teaching, teacher training, and curriculum development. The strategies taught and applied in each of these contexts have proven to be both effective and empowering for students and teachers alike. A list of several teaching tips can be accessed below or by visiting my previous post here. A colleague of mine recently asked me to explain the difference between bottom-up and top-down reading strategies. I feel a need to add the interactive approach to reading to these descriptions, as well. Essentially, bottom-up, top-down, and interactive approaches to reading are the theoretical models used to describe how print is processed. Each are described below. Bottom-up strategies (or bottom-up processing): Bottom-up strategies incorporate the lower-level reading processes that teach students to construct meaning from the most basic units of language, including letters, letter clusters, and words. Students make meaning of a text by building on a foundation of analyzing the smallest units of meaning. Bottom-up reading strategies begin with letter-sound correspondences (the bottom) to achieve comprehension (the top). Bottom-up processing begins with letters and sounds, building to morpheme and word recognition, and then gradually moving to grammatical structure identification, sentences, and longer texts. A phonics approach to teaching reading supports bottom-up processes. Phonics is a method to facilitate students' access to text to ultimately lead to comprehension. I was recently asked if I knew of any rules that govern the differing pronunciations of ough. This letter combination can prove to be very tricky. First of all, it may be helpful to consider the combination gh. 1) When gh comes at the beginning of a word, it has the sound /g/ (e.g., ghost). 2) When gh comes at the end of a word, it sometimes has the sound /f/ (e.g., laugh). 3) When the vowel i comes before gh, the i is long, and the gh is silent (e.g., high; night). This is the case for most gh words. But what about the ough combination? Today is Teacher Appreciation Day. Which teachers come to mind who have left an impression on you? Teaching is often a thankless job. Yet teachers get up and go to work day after day. They continue to prep, grade, and instruct...mentor, encourage, and inspire. What do educators have in common? In my opinion, educators are philanthropists at heart. Here's a video that pays tribute to teachers everywhere. Share this video and a note of thanks with an educator who has influenced your life for good. I always appreciate the opportunity to attend the International TESOL Conference. I enjoy learning what other professionals in the field are doing to contribute to their respective contexts. I also enjoy "stirring the gray matter" and the ideas that come to mind that I can apply in my areas of responsibility. I had the opportunity to present this year on Bottom-Up Reading Strategies for an Interactive Reading Approach. I shared the rationale behind the use of bottom-up reading strategies and their role in promoting an interactive reading approach. I also shared specific bottom-up strategies (decoding and encoding strategies originating from Reading Horizons) that I've used with my students, as well as application activities for applying these strategies in the ELL classroom. The session was well-attended, and several individuals mentioned to me after the presentation that they had been introduced to things in the presentation that they'd never learned before. I shared the free Online Workshop where teachers and teachers-in-training can learn additional bottom-up strategies to apply in their classrooms. I recently returned home from China where I conducted teacher training on phonics strategies and activities for English teachers. 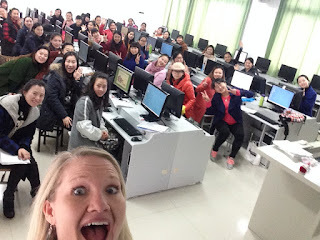 Below is my super-professional selfie that I took with the teachers on the last day of the training. Believe me. I don't usually take selfies with the teachers I work with. But I posted this photo because of the relevance to a concept from Harvard University's Center for Education Policy Research: Teacher video selfies to analyze evidence of your teaching and your teacher performance. The resource, entitled "Teacher Video Selfie: A self-guided module for analyzing videos of your own instruction", can be accessed here. Essentially, teachers record two 10-15 minute teaching segments, and then teachers watch their videos to analyze their performance and self-direct adjustments to their instruction. While watching their videos, teachers write notes about what they notice. Then teachers analyze their notes with guidance from the module/toolkit to learn how to effectively conduct self-observations and set goals for improvement. See the link to view the step-by-step procedure. When you think of a "coach", what comes to mind? I think of an athletic coach. But what about coaches in context of literacy instruction or fidelity of implementation? This past week, I participated in training new implementation coaches who were recently hired to oversee schools implementing the Reading Horizons program. At the beginning of the training, we discussed the implementation coach vision by identifying characteristics of a good coach. Note how these characteristics apply to both athletic coaches and implementation coaches in educational contexts. …takes you back to the basics. A good coach knows that the best way to learn and improve is by doing. …knows that if you want to get better at something, it takes practice…a lot of it. …breaks the process into steps, and then pinpoints specific areas needing work. …focuses on proper form early on to ensure the development of good habits. …helps you master one thing at a time.